“Black Clouds Gathering” is the first full-length album of the Indonesian atmospheric black metal band Vallendusk from Jakarta. The band was formed in 2011 and they soon released the 3-track EP “Vallendusk” via the Chinese label Pest Production. The EP got great feedback, thanks to the band’s mature, melodic and well produced sound. 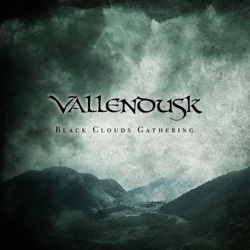 One year later, in the spring of 2013, Vallendusk returned with their debut full-length album “Black Clouds Gathering“, released by the same label again. Vallendusk play a very interesting mixture of epic melodic atmospheric black metal with post and folk pagan metal references. They don’t change from one genre to the other, but they include them all in their wonderful sound. The band has done an amazing job in the guitars, which is by far their strongest card! Their sound is very warm, solid and powerful, with excellent riffs and amazing melodic lead guitars. They also have beautiful acoustic guitars and their orchestrations sound very rich, without any synths at all. My only question after their great EP was if they could keep the same level in a complete album, especially when I saw that “Black Clouds Gathering” lasts over 67 minutes. Well, not only they can, but they are actually better in this new work. The album contains only 7 tracks, but all of them are over 8 minutes long, while the closing track “Land of the Lurking Twilight” lasts for 13 minutes. The tempo changes from fast melodic paces to mid and slower atmospheric rhythms. Their vocals are exclusively black metal screams, with a melodic emotional color, in complete balance with their music. Vallendusk can sound epic, melancholic and warm at the same time, while all their lyrics are in English dealing with epic and nature inspired themes. I strongly recommend this band to fans of epic melodic atmospheric black metal. Vallendusk sound unbelievably mature and professional, especially for their age (as band) and they seem to have a very personal sound! “Black Clouds Gathering” is released by Pest Productions in a 6-panel digisleeve edition, limited to 500 copies. It comes with an 8-page booklet, including all the lyrics. Design and layout is by the band members, while the beautiful photography is by Yudha Lesmana. You can visit the band’s official Facebook page for more info, or listen to the complete album in their label’s Bandcamp page, following the links below.